I was a student for most of my young adult life. Although my parents supported me during these years, I tried to be as independent as possible. I was pretty sure that I would be a single career woman forever, but as I was finishing my last year of graduate school with plans to move to NYC...cupid struck. I met my husband at work. All of my big plans to move away after graduate school suddenly flew out the window. Instead, I was ready to settle down and make it happen right here in DFW. One house, 3 dogs, and enough laughter to last a life time, here we are settling into our little House of Justice. Things I like...or maybe love. THE Fabulous Beekman Boys and a Fabulous GIVEAWAY! WINNER! I might also slice you a piece of cheese! Who likes cheese?! I guess I should ask who doesn't like cheese? Can I get an amen? So, I became obsessed with this television show on Planet Green called The Fabulous Beekman Boys about two city slickers move out to (the absolutely picturesque) Beekman Mansion. Thy have goats, a Llama, and a farmer named John. Seriously, thank goodness for Farmer John. Anyway, on every episode they are eating their delicious cheese, and I was getting so hungry for cheese, that I couldn't take it anymore. So, I went online and ordered it at their online store....while I was there I couldn't help myself, and ordered a ton of their goat's milk soap. Look below for details on how to win a bar of this luxurious soap! But, here is how my package arrived....thank you Brent! Brent does great things with black packing tape. The bags of soap...different months and different smells from the seasons. 60:40 Goat and Cow milks. The Cheese..come to mama! It is called Blaak because they use the old school way of preserving the cheese by covering it hardwood smoked ash. This was featured on the Martha Stewart show to go with the cheese. My favorite is that this is a small operation and each soap has a card that tells you exactly who made it, packed it, and of course wrapped it (not surprised that it was Brent). If you are a fan or a fan of great soap, I am giving away some bars. Not sure which month yet, but they are all good! Leave a comment below on which Beekman Boy is your favorite! Don't forget to join as a follower! As you all know, I have an obsession with Pumpkin Spice Lattes at Starbucks. Ok, maybe you all don't know that because some of us don't really know each other face to face...or see me slurping them down like they are water in a desert. However, as I was having car problems on a rainy day last week, I changed my route to work to drop off my car at the mechanic. This would be the one fix that my very talented husband couldn't fix...to the tune of $445. Anyway, I digress. It was a very bad day. BUT, it was going to be made better by my impulse stop at none other than Dunkin Donuts. You see, I love Starbucks. Really truly, love Starbucks. However, if I am drinking anything other than coffee, I cringe at the price. CRINGE I tell you. 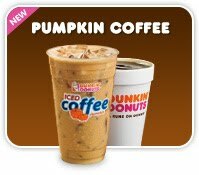 Well, Dunkin Donuts has unveiled a new Fall line up - a line up that includes an ICED Pumpkin Coffee. I live in Texas. It is hot until December 25th....and even then it is sometimes in the 70s. Major Christmas buzz kill. But last year we had our first white Christmas since I have been born, so I can't complain. So, I pull up to the drive through and see a great iced coffee option with a Fall twist. I order it. I drink it. I die. I die for this iced coffee. IT IS AMAZING. It is the only thing that can replace my Pumpkin Spiced Latte. Now, it is like 10 miles out of my way to work. I die again because I know this may be the first and last one I will get to drink...at least during the weekday. But I am saving my money for the weekends and heaven because it is only like $2.50 for a large and the other is like $4.50 for a small. You do the math! Check them out if there is a Dunkin Donuts near you! This last weekend the City of Grand Prairie hosted a Hatch Chile Festival. For those readers who are not in the southwest, you may not know about the Hatch Chiles from Hatch, New Mexico. These peppers are delicious....here are a few facts about the chilies...they are healthy! So, the recipe for Sunday's dinner is SIMPLE and Weight Watcher's friendly. A good jar of Salsa (your fave). First, season the meat with the salt and pepper and Cumin. No real measurements here, just season it to your taste. You are going to add them to a medium to high skillet with some olive oil. Brown them and cook them through (no pink). Remove them from the skillet and let them rest on a plate. Reduce the heat of the skillet to medium. While the salsa reduces a little, slice up your roasted Hatch chilies. These have such great flavor. some roasted red peppers from the jar would also add a nice level of flavor. Now mix them in slowly with the salsa. This gives your salsa a more authentic roasted flavor. Central Market has a whole festival! Then simply top your pork chop with the salsa topping...and ENJOY! to accompany our little piggy. when I post my slow cooker ribs recipe just in time for Labor Day! Every now and then, I find myself starring in the mirror with nothing good to say about myself. We do have those days...we all do. Watch this video and remember how amazing you truly are! Trout Fishing in America Radio...it's awesome. There’s now a perfect gift for the girl who has everything -- including a desire to secretly drink while simultaneously getting a breast lift, the New York Daily News reported Thursday. The Wine Rack, a sports bra with a plastic “bladder” that can hold an entire bottle of wine, is featured at the BaronBob.com website. “You won’t find this at Victoria’s Secret,” Paul Krasulja of BaronBob boasted to the paper. Really? What will they think of next? life. love. and the pursuit of miles.